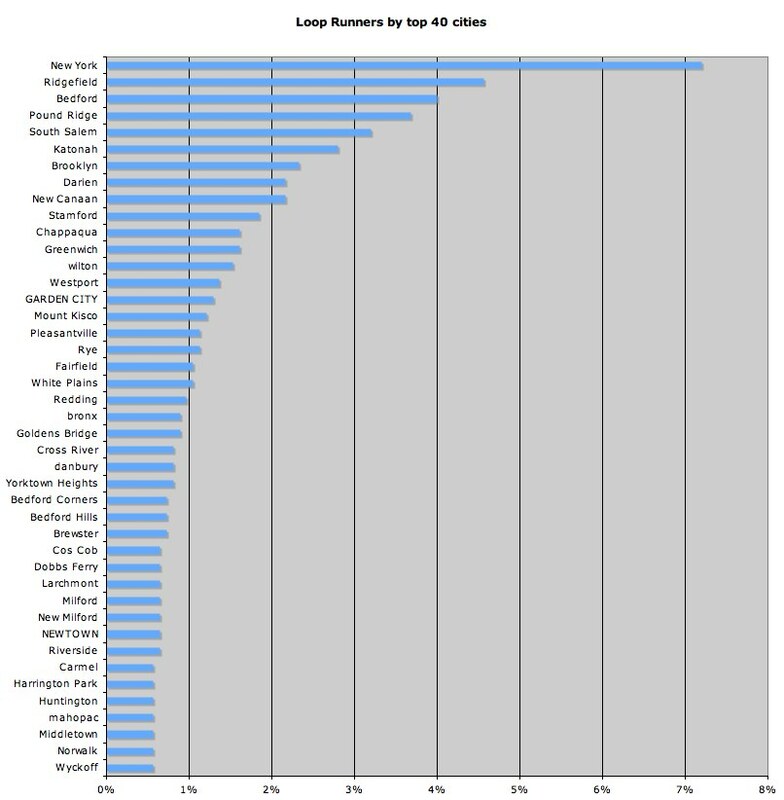 Once again New York City leads in the number of Loop registrants. Ridgefield, CT is #2 by itself, but if you combine the various Bedford addresses (Bedford, Bedford Hills, Bedford Corners), they take over the #2 spot. Pound Ridge and South Salem rank 4th and 5th. Both Pound Ridge (Kimberly Bridge to water stop) and South Salem (mud flats through ‘the wall’) contain sections of the Leatherman’s Loop. Katonah, Brooklyn, Darien, New Caanan, and Stamford round out the top 10. More than 70% of the Loop—including the start and end—is in Cross River NY which was tied for 24th in registrations. Cross River, South Salem, Goldens Bridge (#23), Waccabuc (#43), and Vista are all part of the town of Lewisboro NY. Harrington Park and Wyckoff were the top NJ towns (tied at #38). There are nearly 300 different towns and cities represented by runners in the Loop. Top states are NY, NJ, and CT. 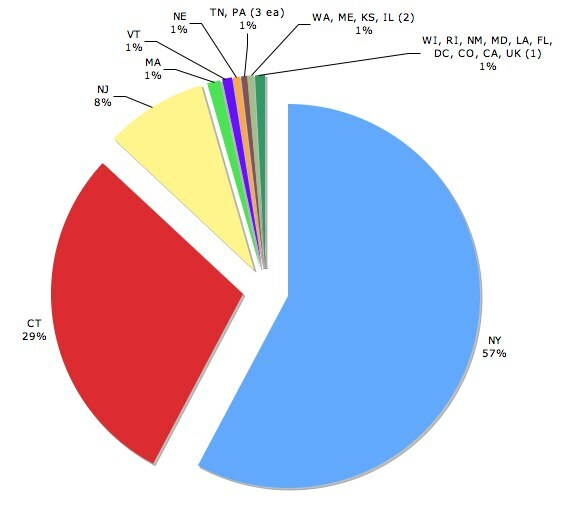 Together these three states accounted for 94% of the registrations for the 2010 Loop. Next was MA, then VT. The surprise this year is in the #6 spot: Nebraska! No, this is not a typo—we are getting a visit from six members the Leatherman Family: Eric, Zach, Andy, and Daniel along with two significant others. They are not only our first registrants ever from Nebraska, they are also the first Leathermen since the late 1880s to run the Loop! We will also have representatives from 15 other states plus a runner from the UK. Maine, Tennessee and Pennsylvania each have 3 runners. Washington, Kansas, and Illinois have two runners each. We have one runner registered from Florida, Georgia, Wisconsin, Rhode Island, New Mexico, Maryland, Louisiana, Washington DC, California, and Colorado. All total there are 21 states and two countries represented in this year’s Loop! That equals last year (with some different states) and is up 50% in state representation from 2008. « Registration Finished - On To Carpooling!